When Charlotte visited Buckingham Palace recently with CanIWalkMummy and CanIWalkMummy's Mummy, she was bought this rather glossy and fantastic book all about The Queen. It's filled with lots of questions young children put to the queen, either in letters or directly and has been written and illustrated in conjunction with the approval of Her Majesty. A friendly footman shows two children around Buckingham Palace, and shows insights into the Queen's life from a child's perspective. The two characters in the book are inquisitive and love exploring the palace and hearing all about the fascinating facts surrounding our monarch. When I was a child, the Ladybird books on royalty were the be all and end all, but books like "Does the Queen Wear Her Crown in Bed" update the core ideas of giving us "common folk" an insight into royal life in a more contemporary and accessible way. This book is available via the internet, or from any Royal Souvenir shops. Harriet the Hedgehog is a joyful little soul. On her way to visit her best friend, she is so happy that she starts to dance. Spotting some butterflies she wants to join them in their dance but the butterflies are mean, and don't want to dance with a silly little hedgehog. This is a lovely heart-warming tale of how Harriet manages to convince those mean butterflies to change their mind. Infectious characters, simple but effective illustrations and a nice moral lesson for children are all wrapped up in this stylish little book. Charlotte's best bit - Harriet covered in flowers. Daddy's favourite bit - The mean butterflies changing their mind. This book is about as girly as it gets, which is fortunate as Charlotte is a very girly girl. It's a bit like a fairy-filled version of the "Where's Wally?" books. Each page is filled with objects, and children must find (and count) all the listed things on the side panels of each page. It's not as easy as it sounds (for adults like me at least, some of the pages are so exquisitely detailed that you could spend all day looking for 12 unicorns!) but it's pink, sweet and fluffy - a bit like a fairy marshmallow. Fulfilling my promise to pick up one or two 'proper reading' books for Charlotte in our weekly library visits, I grabbed Peg Leg from the Reading Corner Phonics series. There are seemingly a million and one phonics-based books on the market, and so many to choose from that all seem to use different standards but the Reading Corner Phonics series use simple repetition, easy to understand words and fantastic illustrations to help your child to learn character and word recognition, as well as making them giggle with entertaining tales. Peg Leg is a pirate (and what kid doesn't love pirates?) On a hunt to find treasure, Peg Leg press-gangs his cabin boy into digging up a sandy island looking for loot. Peg Leg wants cash, but all Peg Leg seems to find is other people's rubbish. Does the wooden-limbed pirate get rich? Find out in this engaging early readers book from a very well established series. Daddy's favourite bit - Rather good use of repetition, memorable phrases throughout and of course an engaging subject for kids. Goat and Donkey are best friends. Goat is rather nervous, but Donkey is super-brave. In this little tale we find out what happens when Goat hears a mysterious noise in the middle of the night. Is he brave enough to go and find his friend Donkey and investigate? Goat sums up all his courage and does exactly that. The twist in the tale is lovely, but what makes this book rather special is the sumptuous colourful illustrations by Russell Julian. Goat and Donkey are great animal characters and children will be on the edge of their seats (or their beds) wondering what will happen at the turn of every page. Daddy's favourite bit - Midnight feasts! We've reviewed Colin McNaughton's excellent Preston Pig adventure "Suddenly..." here at ReadItDaddy. Here's another book in the series, and once again the Big Bad Wolf would like nothing better than to make a nice bacon sandwich out of our witless hero, Preston Pig (who is always renamed "Merlin the Happy Pig" by Charlotte for some unknown reason). Preston has been rather naughty at home, breaking a precious piece of his mum's china, so he's sent on an errand to visit his poorly grandmother with some goodies. The tale takes a rather familiar twist, and even the hapless wolf tries to remember where he's heard of a story where someone wearing a red hood goes to visit their grandmother with a basket of goodies - and of course what happens in the end. If only wolves had better memories eh? Oops! Daddy's favourite bit - Sly stealing of a classic story and turning it into something hilarious. Here's a very odd children's book. Can you imagine all the things a mouse might be afraid of? No? Well here's a handy pre-chewed reference book that not only has a really unique layout and set of illustrations (with a very mousey feel throughout), but a book that teaches children the long and convoluted names of various phobias. Musophobics (those scared of mice, not music!) might not like the rodentine flavour of this tome but it's sparklingly original, very informative and quite fun when you watch your children trying to wrap their tongues around the various words within. I have it on good authority from my beautiful and wise other half that I have been neglecting my blogging duties. Work has got in the way once again but now I've got 5 minutes free and a full cup of coffee for my afternoon break, I'll dive back into our recent stack of books from the library and resume reviewing duties. "Yuck! That's not a monster" is a delicious little book full of, well, monsters obviously - but one monster in particular is a little different from the rest. When Mr and Mrs Monster have a clutch of three eggs, two hatch into nasty spiky little beasties but one contains a rather sweet, fluffy little creature the proud parents name "Shock!" Shock is shy, shock doesn't like stamping on worms or scaring people like his brother and sister. In fact his brother and sister have to tow him around in a cart with a tarpaulin over him to save their embarrassment at having such a wet and weedy little brother. However Shock gets the chance to prove himself. How? Well obviously you'll have to read the book but it's rather sweet and funny with some cracking illustrations courtesy of Alison Edgeson. Charlotte's best bit - Shock is a bit soppy, let's put it that way! Daddy's favourite bit - Parenting tips, monster style. Breathe stinky breath on your kids and then wail to them! Coming soon to CBeebies is a new adventure series from the makers of Bob the Builder, HiT Entertainment. Mike the Knight is a CGI animated series all about the adventures of a young lad who just happens to be a medieval knight, living in the mythical land of Glendragon. Mixing dragons, sorcery and plenty of knightly antics with a whole host of interesting new characters, we were fortunate enough to take a look at three episodes of the series ahead of broadcast beginning on Halloween (Monday, October 31st 2011). Evie - Mike's sister, a little girl with a touch of magic about her. Evie often helps Mike in his adventures. Fernando - The hispanic bard, always on hand to provide a tinkling tune or sage rhyme or two. Sparkie and Squirt - Mike's trusty dragons, one breathes fire and the other breathes water. The animation on the show is top notch, as you'd expect from a HiT Entertainment show. Charlotte's favourite character was Evie (naturally, good to have a girl-friendly character in a series that you'd imagine was aimed squarely at boys - but actually has a fairly universal appeal). We rather liked the various gadgets and of course the "Big Book for Little Knights" which gets Mike out of trouble on several occasions. The only minus point was the theme tune (argh, my ears!) but you can bet by christmas you'll be hearing children up and down the land saying "Be a Knight, Do it Right!" as this looks set to become an extremely popular addition to the CBeebies programme schedule. Keep a keen eye out for Mike the Knight and the Smiley Treasure, the first episode airing on October 31st and the other 9 episodes following on Tuesday November 1st, Thursday November 3rd and thereafter. Now all HiT need to do is get the Mike the Knight merchandise in the shops before christmas, as a toy line based on this show would definitely end up at the top of most children's christmas lists. Daddy's favourite bit - Loved the animation on the titles (cardboard cut-out style backgrounds and lots of medieval styling) but noooo not the theme song. Feeling poorly? Nasty cough and cold? 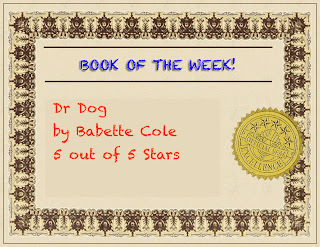 Then you need Dr Dog, the canine medical expert and the star of our book of the week this week. Dr Dog belongs to the Gumboyle Family, an unhealthy (and pretty gross) bunch who send for the poor pooch while he's on a lecture tour of Brazil. 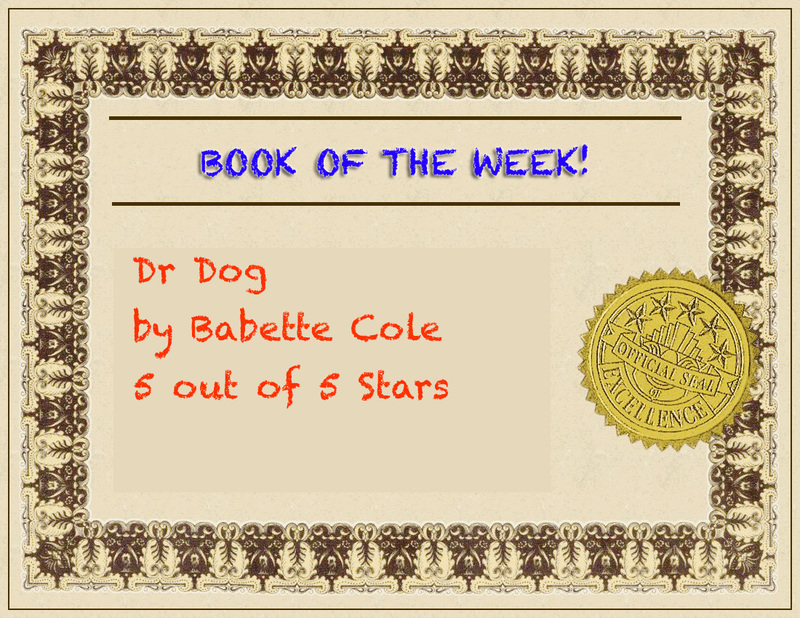 Dr Dog soon gets down to the grubby business of curing the family's various ailments in hilarious style. Grandad's wind, Kurt's illicit bike-shed smoking and Baby's absolutely disgusting habits are all tackled in good stead by Dr Dog. Babette Cole's book is a mixture of fantastic wobbly cartoon drawings, true facts (rather gross true facts, it's fair to say) about the human body and all the horrible things an unhealthy family do to it. Like all children's books that err on the side of being slightly unpalatable, this has been a massive hit with Charlotte - so much so that the other 7 books we got from the library have been swept aside in favour of reading and re-reading this little gem. Deservedly our book of the week. Daddy's favourite bit - Dr Dog's cure for his own stress. Rating - 5 out of 5 stars - Book of the Week! The Oxford University Press "Reading Tree" series of books are used in schools for early readers and are published in "skill sets", grouped by a child's reading age. Old Tree Stump is a contemporary spin on the classic "Giant Turnip" children's story. In this book, a young lad tries to help his dad move a bothersome tree stump from the back garden. It's too big a task for the pair of them, so they enlist the help of various characters from their neighbourhood. Like most of the Reading Tree books, Old Tree Stump contains repetition and plenty of easy to identify / easy to read words for young readers. Great illustrations help young readers along with their reading efforts. They're a great series of books and should definitely find their way into your child's library if they fancy getting a head start before starting school. Charlotte's best bit: The end of the story and what happens to the stump! Daddy's favourite bit: The same. As promised, Charlotte, Mummy and I dropped by the Barefoot Books launch weekend for their new studio space in Twining House, Summertown (it's about the prettiest building in Summertown, and harks back to the turn of the 20th Century). If you've been wondering what those mysterious footprints are that have been springing up on Summertown's pavements, wonder no more. Though the studio has been open for a week or two as a 'soft launch', the opening weekend marks the studio going fully operational in grand style. Stepping through the doors, Charlotte's face lit up as you're instantly plunged into an amazing environment packed with interesting colourful decoration, and of course lots and lots of Barefoot Books (don't worry, you aren't required to take your shoes off but I guess you can if you really feel the need). The inside space is on two levels. On ground level you have the Barefoot Books shop, the amazing Barefoot Cafe, and lots of cosy little corners and areas for a bit of spontaneous book reading (we sat down to read "Shopping with Dad" and were a bit surprised to be filmed / photographed, but didn't really mind). Charlotte was most taken by the huge throne in the corner of the room. I get the feeling that throne is going to be fought over by lots of children who visit the space. The Barefoot Cafe sold some extremely yummy looking cakes, excellent coffee and various meals tailored for adults and children from locally sourced organic ingredients. The studio's upper level contains another story and activity space, and the swish Oxford offices of Barefoot Publishing (somewhere I'd give my right arm to work, such an amazing looking office space!). The glass front means that you can curiously peer at the extremely busy folk. They don't mind, honestly. Our incognito ReadItDaddy visit didn't last long - we were recognised as we browsed the store but it was lovely to meet Trude and get some more background information on the launch and the future plans for the studio (we'll be covering some of the events coming up in a very packed Barefoot Books calendar). After a bit more browsing and a timely purchase of the excellent Yoga Pretzels cards (Charlotte is an absolute Yoga diva!) we left feeling like it'd definitely be somewhere we'd be coming back to frequently. Daddy's favourite bits - The amazing looking studio space, the yummy looking cakes on sale at the cafe, and the intense aroma of that coffee. Mummy's favourite bits - The mobiles and the amazing world map. It's all go down at Barefoot Books new studio on Banbury Road, Oxford. Though Barefoot have already moved into the snazzy building (see my previous post) that used to be the old Grocery Store, this weekend marks the official launch of Barefoot Books new studio with a party tonight, and an official family friendly open weekend this weekend. The place looks utterly fantastic (I pass the studio on my way to pick up my daughter from nursery) and Barefoot seem to have settled in to their new home nicely. 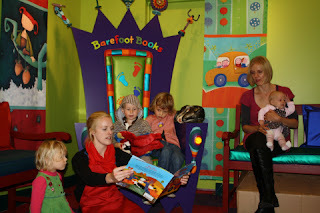 Check out the Barefoot Books Blog for more information on the launch weekend, and more photos from the Studio. We'll be dropping in tomorrow around 11 am to give it the ReadItDaddy once over so look out for us! Learning to read must be one of the most daunting things a youngster has to take on. So much to learn, so much to remember and the increasing pressure on youngsters to learn to read at earlier and earlier ages makes the whole thing 100% harder. Doubly so if you're a parent who wants to give their child the right start with reading on their own. There are so many early reader books out there, and this week we went back to basics with our Library choices, selecting 4 books that are designated early reader books, and 4 books I can read to Charlotte. First in the pile of early reader books was "The Queen, The Mice and the Cheese" by Carrie Weston. Described as a "Blue Level 2 Reading Corner" book (with an extremely complex stage diagram to explain exactly what that means), it's actually a fairly humorous and comic take on a classic fable. The cheese loving queen of the land has a mouse problem. Her love of cheese has brought the nation's mice to her door and in a desperate bid to get rid of the mice, the queen consults her trusted aides to help her. They suggest cats, lots of cats which succeed in getting rid of the mice. But who will get rid of the cats? Hilarity ensues as the whole book describes the houseproud queen and her attempts to remove her unwanted animal guests with a neat little circular twist in the tale at the end. For early readers, text is well laid out, repetition is used to reinforce the words used in the book, and the clear comic illustrations help to give children something to help them memorise the words, the characters and the plot. If your child is truly right at the beginning of their reading life then it's best to start off with something far simpler than this, but if they're advanced enough to recognise letters and words, this is a short and sweet little book that is interesting enough for them to want to visit and revisit.